Neu-Isenburg, March 2014. 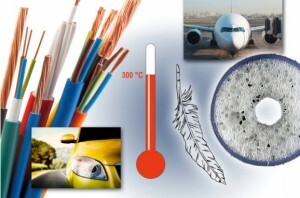 DuPont Chemicals and Fluoroproducts (DC&F) will be exhibiting its wide range of fluoroplastics for the wire and cable industry in hall 17, stand D59 at Wire 2014. A new addition to the range is ECCtreme® ECA, a class of melt-extrudable perfluoroplastics which combines the advantageous mechanical, electrical and chemical properties of PTFE with high thermal stability. For instance, at a thickness of 0.75 mm, the material has an RTI (Relative Thermal Index) listing of 300 °C according to UL 746B. Thanks to its continuous service temperature of 300 °C, ECCtreme® ECA thus exceeds the previous upper limit of 260 °C for conventional perfluoroplastic insulating materials. “This development is our response to industry’s challenge to offer a high-temperature, melt-extrudable perfluoroplastic”, explains Frenk Hulsebosch, Global Business Leader at DuPont Fluoropolymer Solutions. ECCtreme® ECA grades can be processed on conventional extrusion equipment for high-temperature fluoroplastics using standard processing conditions. Downstream heat treatment (epitaxial co-crystallisation) improves the material’s thermal resistance and offers beneficial mechanical properties, such as long-term tensile modulus and improved stress cracking resistance. Further products presented on the stand will include Teflon® fluoroplastic foam resins (FFR) produced using patented Airquick technology. Cables made with foamed fluoroplastic insulation have a lower signal return loss than conventional data cables, so enabling miniaturisation and weight savings thanks to lower density and thinner insulation thicknesses. One current example is the new KL24 Star-Quad data cable developed for the aerospace industry by Draka Fileca, Sainte-Geneviève, France which won a DuPont Plunkett Award in 2013. At identical diameter, it is up to 25% lighter than previously used quad cables and enables a reduction in aircraft fuel consumption, so reducing environmental impact. Wire and cable insulation made from DuPont Chemicals and Fluoroproducts (DC&F) have extreme chemical resistance, very good electrical properties and elevated thermal stability. Common features are elevated dielectric strength, low permittivity, a low dissipation factor combined with extremely low specific electrical resistance.